So, as many of you have no doubt already noticed, I'm "Subject to Stupidity". 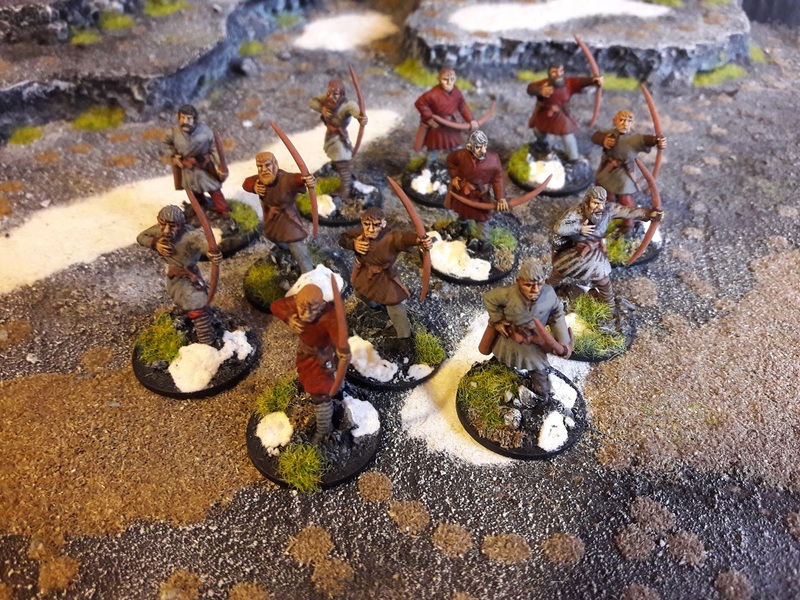 In the last post I wrote for this project, I presented a unit of spear-wielding levies as being a unit for my Saga Vikings, only to have it pointed out that Vikings don't have spear-wielding levies in their army list. So, this unit is a replacement for the previous one, who will get re-purposed into a Strathclyde Welsh army at some point. Here is the - somewhat belatedly - finished product for my contribution to DreadTober 2017. Life went to hell in a handbasket a few weeks ago when a family member was hospitalised. We had to make significant changes to our home and schedules in order to provide care for her. Wargaming, painting and modelling had to take a back seat. Whilst we're still mired in the situation, I did manage to find a few minutes yesterday to photograph some of the models I'd been working on at the time so that I can upload something new to the blog instead of re-sharing finished projects from days of yore (that said I've got a few more of those to share so I'll drop one in from time to time). The final set of troops and APCs for the UCM force I'm building. Anyone who follows my blog will know that our family has had some upheaval due to illness recently and so what I'm sharing here are photos of models I actually finished a few weeks ago but never had time to photograph. This set of Dropzone models is the final batch that I managed to complete before it all went wrong. I'll carry on and complete this army, but probably not until 2018. Stay tuned. Here you will find the second of two sets of three posts regarding my Dropzone Commander UCM Troops and Bear APCs. Each post shows two units (one Bear and two Troop stands being one unit. I think. Still ploughing through the rules). The Hawk Wargames plastics are definitely easier to work with than their resin counterparts. 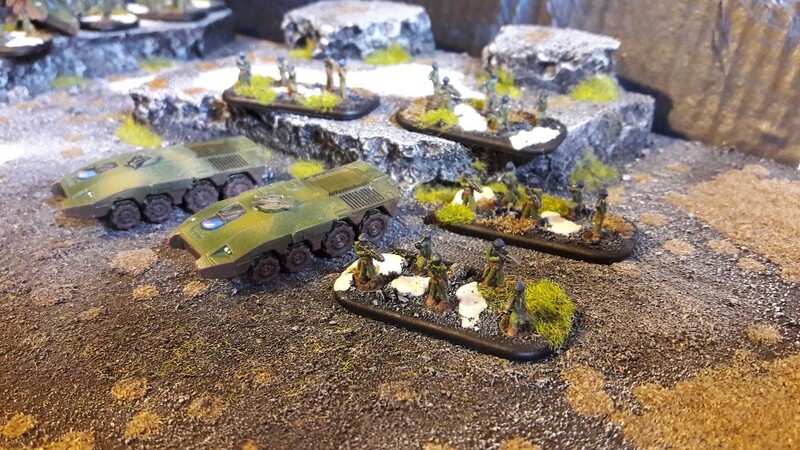 These are 10mm scale models - it's a nice scale to work in. I'm enjoying it. 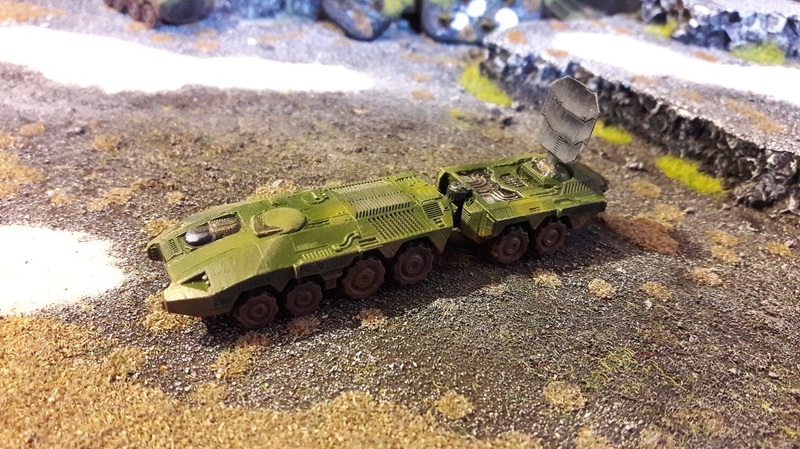 Here is the Kodiak Command Vehicle for my Dropzone Commander UCM force. It's a bit odd: The main part of the model is basically identical to the Bear APC models, but with a "tow-bar" added. The Bear models are plastic, this is resin. I can see no real reason they made this in resin - there's no additional detail on it and the foibles of resin casting have left this as a slightly deformed model that doesn't quite fit together properly. I did it again. I started another project. I swore blind to myself that I wouldn't. I did though. I'm a liar. A friend pointed out to me that Dropzone Commander 2nd edition was due for release soon and that a webstore I like was clearing its shelves of 1st Edition stuff at half price. So I bought two starter sets and a handful of extra bits. I determined that this was going to be a project where I broke out (and used!) my long-ignored airbrush. I've never really got fully to grips with it. It's a slippery beast and seems designed to frustrate by clogging, spitting and looking at me funny behind my back. Anyway, we wrestled, scrapped and tussled for a bit and in the end I produced a set of models that I'm happy with. 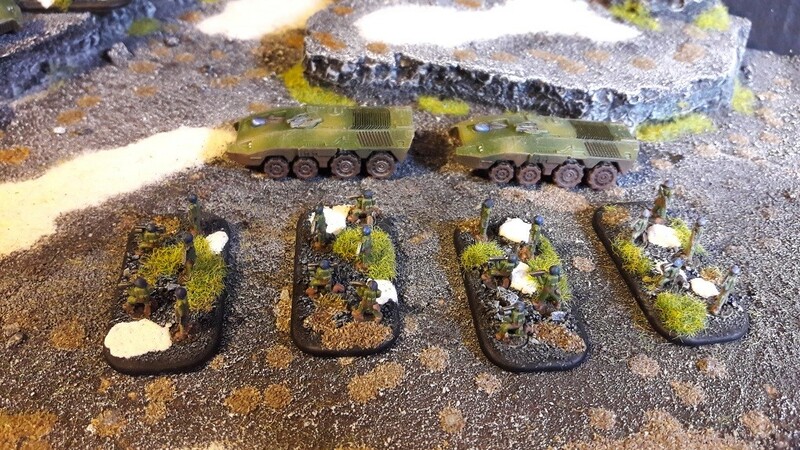 All have had their base colours & camouflage airbrushed on and details added with a regular brush. I'm about half-way through painting the UCM forces from the boxed set - all the Bear APCs and the Troops are complete, as are the extra bits & bobs I picked up. 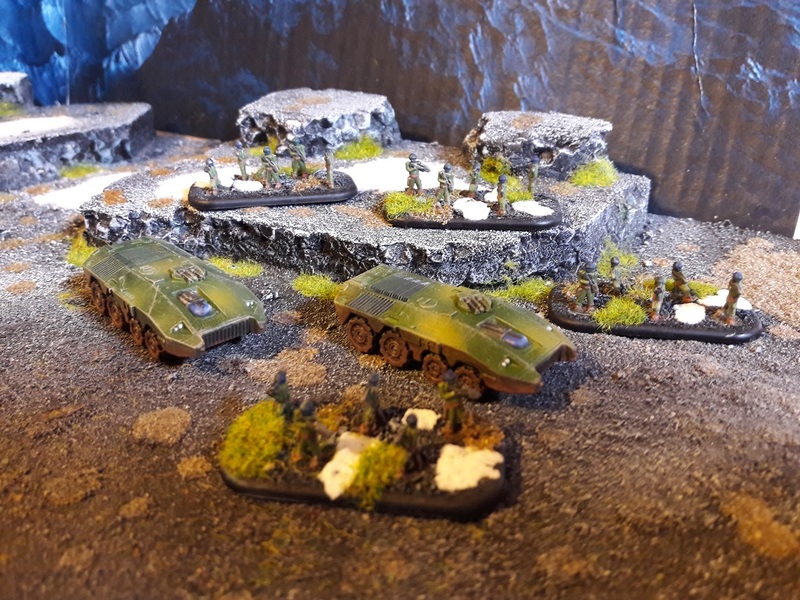 I've just got the tanks and carriers to go. And the Scourge. At the present time, it is difficult for me to work on modelling projects due to family circumstances. Being slightly obsessive, such things are rarely far from my mind and I found myself having a nose through my blog and reviewing some things I've worked on in the past. 2018 will be the 10th anniversary of two of the biggest scratch-build projects I have ever worked on. I was given a copy of the first edition of the "Apocalypse" rulebook by my friend Mike who also gave my son James (who at that point was still gaming) a Baneblade model. 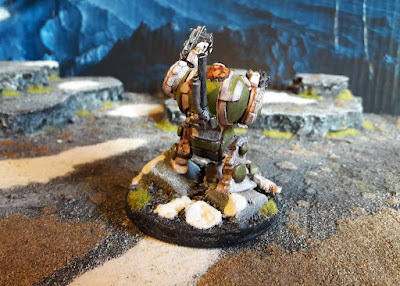 This, along with a challenge which James gave me to scratch-build a Titan - inspired us to do some modelling work and arrange an Apocalypse game! 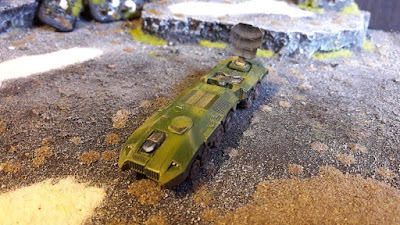 The Baneblade was quickly assembled by James, but lay unpainted for a long time until I picked it up and completed it a while back. So, since we're not millionaires, I accepted James' challenge and embarked upon my first scratch-build project - a 28mm scale Warhound Titan. 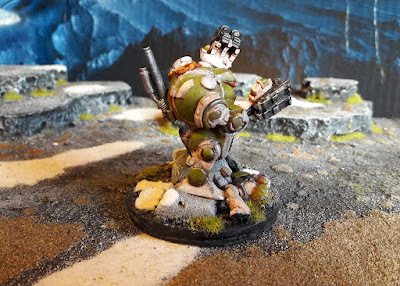 Whilst I am still immensely proud of the achievement, I've always felt disappointed by the overall result; the paint-job is poor and there is not nearly enough detail on the model. Too many flat surfaces. The basing is uninspiring too. Don't even start me on the banners - awful. I'd like to think my painting skills have improved somewhat since I did this and it looks horrible to me now. The "good guys" were sorted - a large force of Imperial Guard (played by me) with allied Ultramarines (supplied and played by a friend of James') were facing off against a force of Orks (played by James) with allied Necrons (played by Mike). 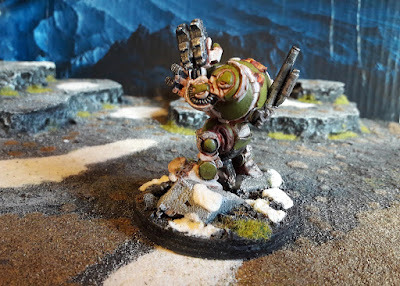 Conscious of the fact that the "baddies" were under-represented with larger models, I also scratch-built a Stompa for the Orks. 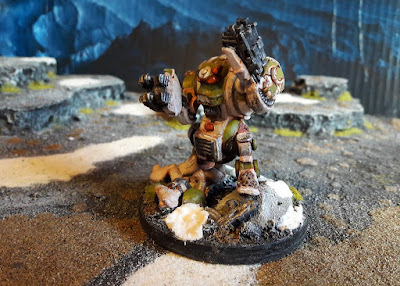 Neither the stompa nor the titan have progressed past this point. Enough is enough, so, I resolve for 2018 to get this Battle-Puppy and metallic Bigfoot back out of their boxes and rework the finish. I may even build the two missing guns that I was originally going to create for the Titan, so that it can have interchangeable weapons. 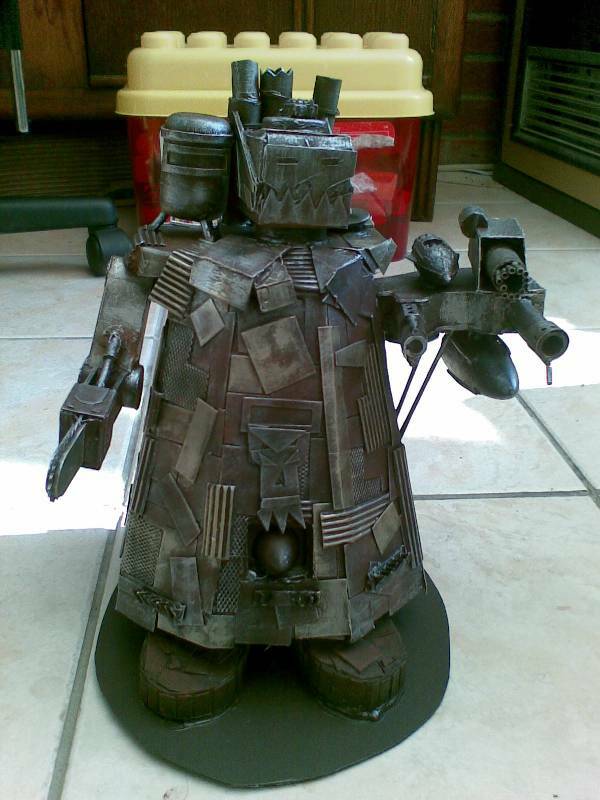 The Stompa needs its feet working on, a better head and the gatling cannon thingy is a bit naff too. I also have in mind another "Lords of War" scale project - I might do it in 2018. Not decided yet. I picked up a second Baneblade model a while back with a view to using it as the basis for an Astra Militarum Gorgon troop carrier. I've always loved the Gorgon model but as I've already said "I'm not a millionaire". Watch this space. Brace yourselves for lots of black-and-yellow hazard markings!